Maslow’s (in)famous pyramid of needs is often a focal point for many cultures managers as they think about their workforce and their needs. 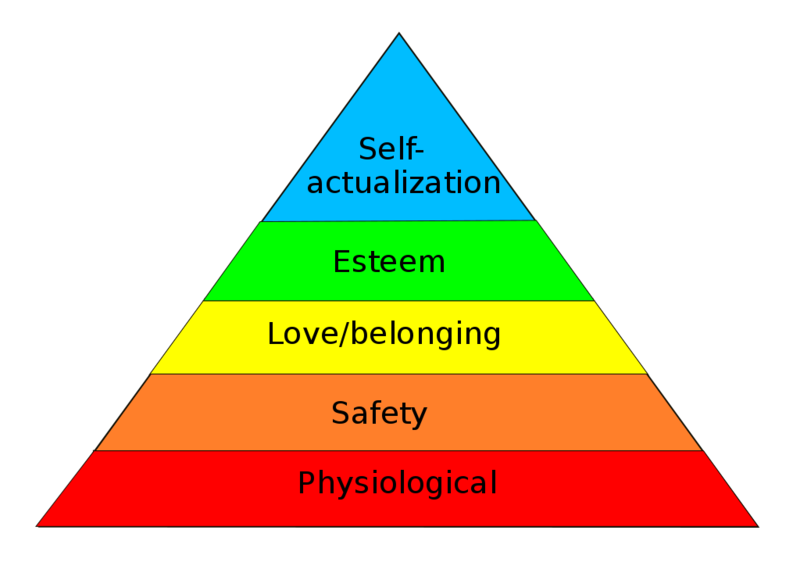 The psychologist did indeed think through the hierarchy of needs, but he was not responsible for organizing it in those colorful triangles you may have seen before. In fact, a management consultant came up with the design. The twist? It was based on a deep misinterpretation of Maslow’s thoughts and work. Maslow’s life is a bit of an Odyssey in itself. Born to immigrant parents, he grew up in a traditional Jewish household in Brooklyn, NY, and was often bullied. The hatred he encountered led him to psychology as he looked to better understand the source of these feelings. The psychologist had a prodigious mind which helped him attend numerous universities and develop his theories over time. His work primarily focused on human improvement using a new base as opposed to standard Freudian frameworks which were the norm at the time. Prior to his death, he argued that self-actualization (the highest strata of the pyramid) was (wrongly) biological, leaving out certain individuals and communities by design. Ultimately, his work stood the test of time largely because of management’s infatuation with the said framework. We’ve discussed management techniques in the past, but Maslow’s work truly shaped today’s understanding of work. Charles McDermid, a psychologist at a Wisconsin-based consulting firm, originally created the pyramid based on his misunderstandings. However, this altered the work forever and sent ripple effects we still feel today. Indeed, the pyramid embodies post-war ideologies, especially around individualism, nationalism and capitalism. Purely through its shape, it falsely concludes that we must fulfil each step to move upwards. Likewise, not everyone can reach the apex in this context, creating a highly centralized power structure. This ultimately justifies pay gaps, certain treatment of individuals and mismanagement practices. However, we know from studies (and life itself) that things don’t work that way. People can be self-actualizing at any given point, without having to wait to be at the top of the pyramid. Maslow did little to critique this over time, instead living off-of the misinterpretation. 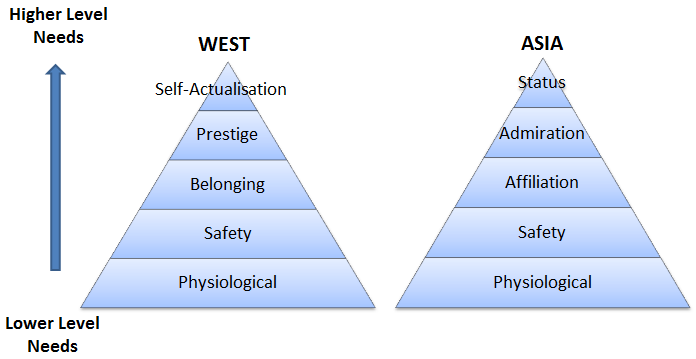 Maslow’s Hierarchy of Needs is presented from a “Western perspective.” In Asian and more collectivist societies, they share different motivations that are more community-focused. A redesigned Asian pyramid ultimately ties in with the idea of “face” as a sociological concept. Face entails behaviors and customs that are tied to morality, honor, and authority. To level up to is to increase the amount of “face” you possess. If anything, we are seeing reversing trends across workplaces. Whilst there are still many environments and cultures that are top-heavy, more places are changing, empowering employees at all levels to take more initiatives. As the pyramid flattens out, so too do the ideas associated with the antiquated framework. Younger employees inevitably challenge organizations to improve and offer more than just a paycheck, especially in an environment of constant fear of layoffs. 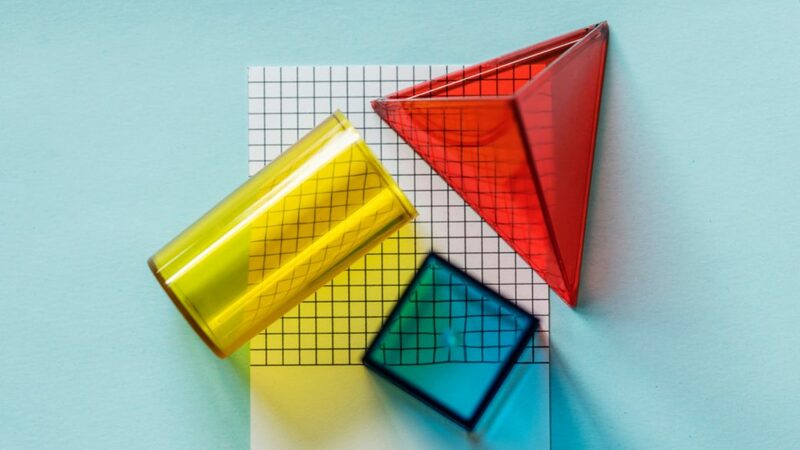 Rather than box people into a simple framework, companies tackle problems holistically instead. This leads to greater job satisfaction, productivity, and dare we say it, self-actualisation. Studio D is a modern company aiming to bring clarity to the complex world around us. The multi-faceted studio is a combination of “discreet international research, design and strategy services to multinational clients with a global remit.” While most of their work is in service of large multi-national companies, they maintain several forward facing projects. These ongoing projects include The Fixer List, a network dedicated to high-level producers and fixers globally as well as SDR Traveller, some of the most innovative and functional luggage offerings out there. As an aside, you can also check out cool recycled tech bags here. 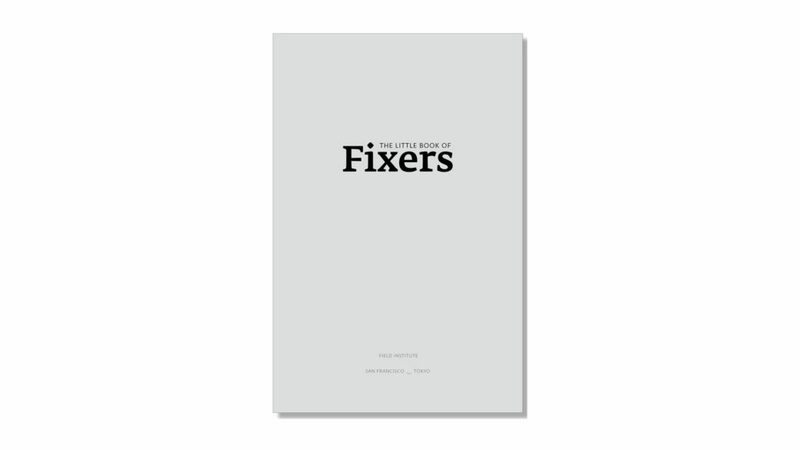 The Little Book of Fixers is a consolidation of Studio D’s efforts and interest in producing and running complex international projects. Hundreds of fixers have lent their expertise. These tips and tricks hone on the ability to find the appropriate help in foreign settings and the best practices to work with local communities. It’s a challenge to create authentic and meaningful outcomes in foreign settings. Studio D’s expertise can serve as a reference point on understanding, respecting, and collaborating with locals. Without accounting for local nuance, the outcomes can sometimes be suboptimal. The Little Book of Fixers is available now through the Studio D’s online store as well as Amazon for USD 34. Colin Kaepernick has been a dominant cultural force ever since taking a knee at an NFL pre-season game in 2016. His opposition to America’s oppression of the black community sparked intense debate. While Kaepernick ultimately forced his own exile from the NFL, he has had a broader impact across several areas. In 2018, he starred in a powerful Nike ad titled “Just Do It,” which pushed athletes far and wide to take control of their destiny. 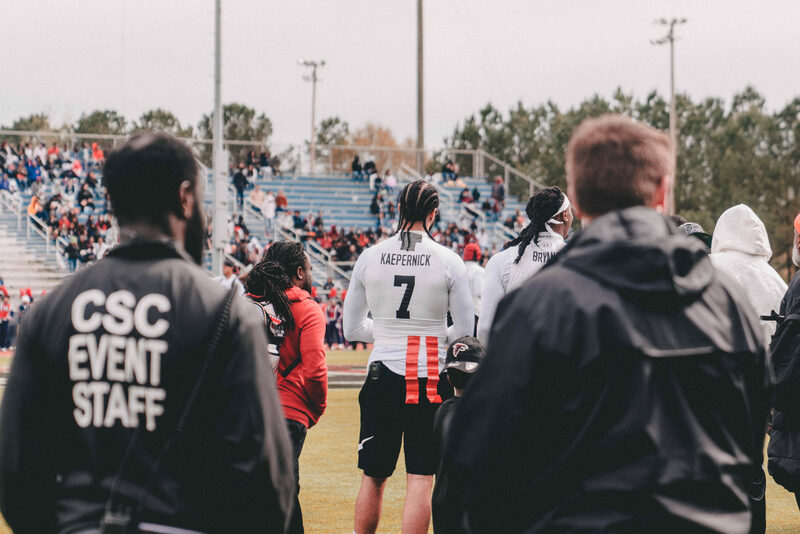 Last month, Quavo of The Migos hosted his second annual Huncho Day football event. 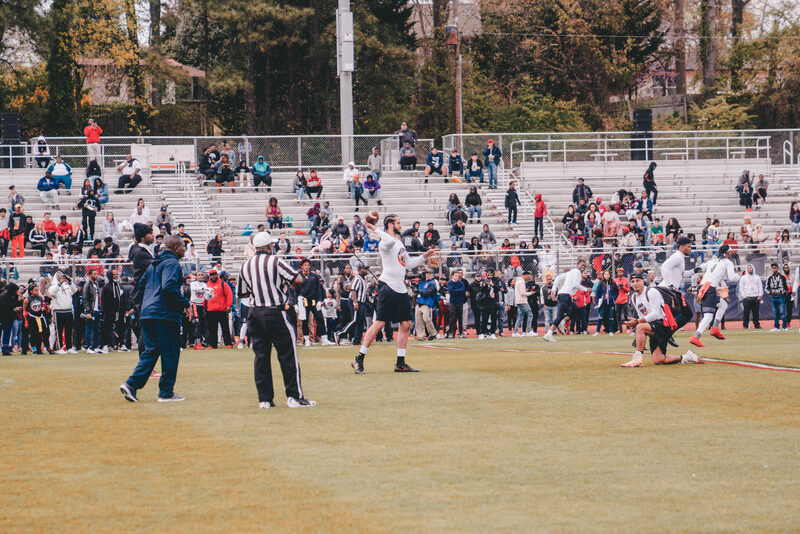 The casual game has brought together athletes and entertainers alike with a focus on giving back to Quavo’s high school alma mater, Berkmar High School. MAEKAN Community member Gavin Guidry, a Senior Art Director at Havas, was on hand to document the day’s events. No stranger to the solidarity of Atlanta’s black community, Gavin provided his insights into the power and inspiration of Colin Kaepernick. Tell us a little bit about the event. What was it was all about. 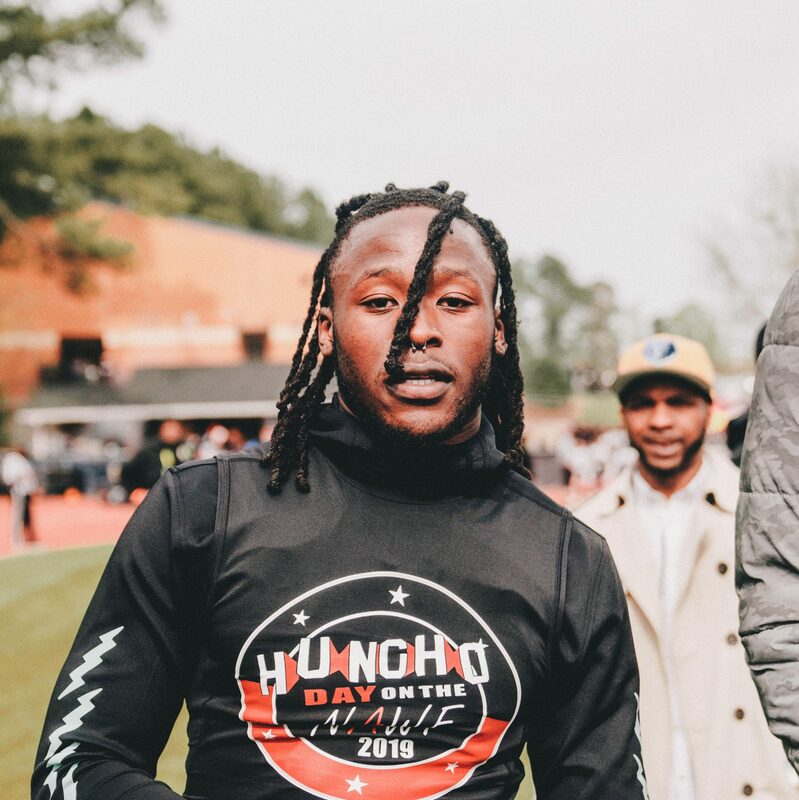 Huncho Day is a give back event from Quavo of the Migos. 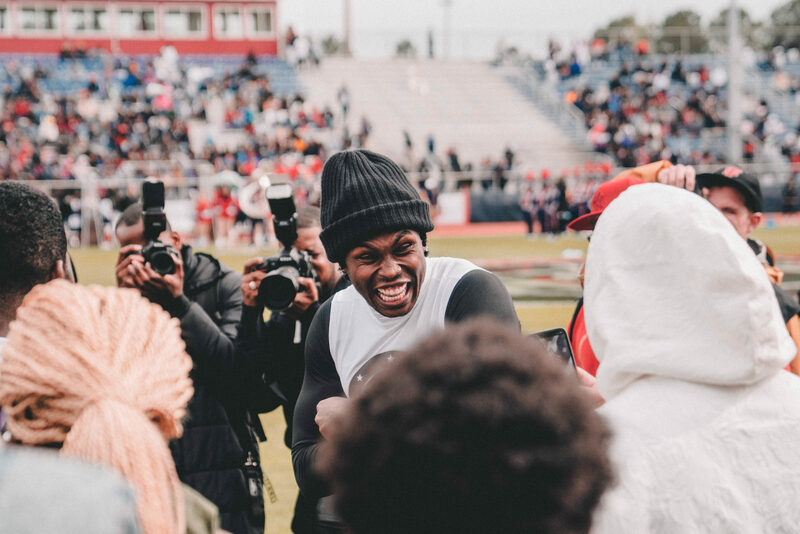 He was a quarterback at his high school (Berkmar High School) so his way of giving back is giving his alma matter and kids of the community a full day of fun centered around football. They have a carnival for families, a football camp for kids, and then cap it out with a celebrity game of flag football with some of the world’s biggest celebrities and athletes. Kaepernick has been a big point of discussion over the last few years. How do you see? Athlete? Activist? Something else? So it’s funny because I have come to see Kaepernick as this larger than life activist who is starting conversations and igniting a movement. But for this day, he was an athlete just having fun throwing the football around with his friends, which I think is probably how he wants to be seen. I don’t think he ever meant to become this huge civil rights figure, just an athlete that uses his platform to talk about things he believes in. After all the focus around his most recent campaigns, what’s it like seeing him in the flesh? Kaepernick? Well I was super shook because I knew he had been in Atlanta but had no idea that he would be there. First off, he’s like 6’6″ so his presence becomes literally larger than life. 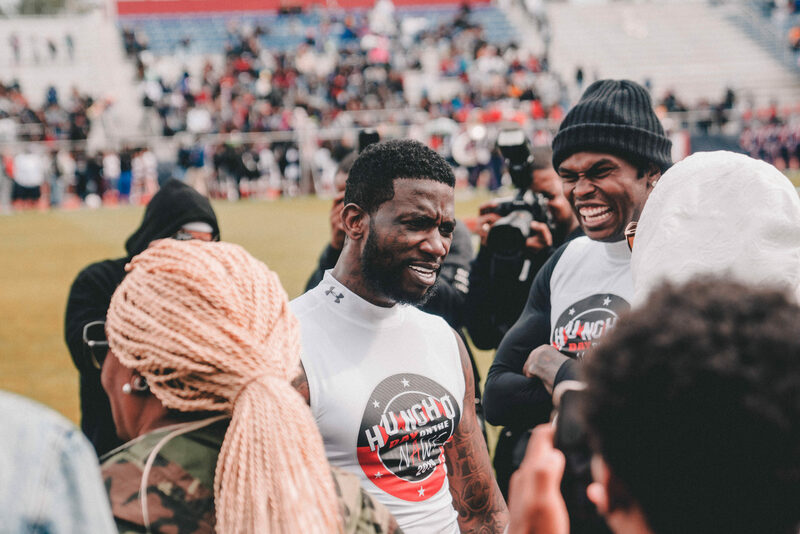 Seeing him call plays with Quavo and Julio Jones and throwing passes to Saquon Barkley made me smile because you could tell how much he enjoyed playing. He was cracking jokes and laughing basically the whole time, so I could see his love for the game. But the NFL isn’t letting him do the thing he loves right now, so it was kind of bittersweet. What sort of hope does somebody like Kaepernick give? He gives hope to people that don’t speak up out of fear. When he first got cut, I think people were viewing him as a cautionary tale, but he’s been able to grow his platform and his influence to keep the conversation going. Favorite moments from the day? Definitely seeing Kaep throw a touchdown to Saquon Barkley. Seeing Von Miller dance before every snap. Or Gucci, Quavo and Julio cracking jokes with Coach K and P from QC. The amount of love and positivity that was there is contagious. It was such an Atlanta thing. All of these celebrities, most of which were black men, came through just to have fun. I think the world needs to see more of that. 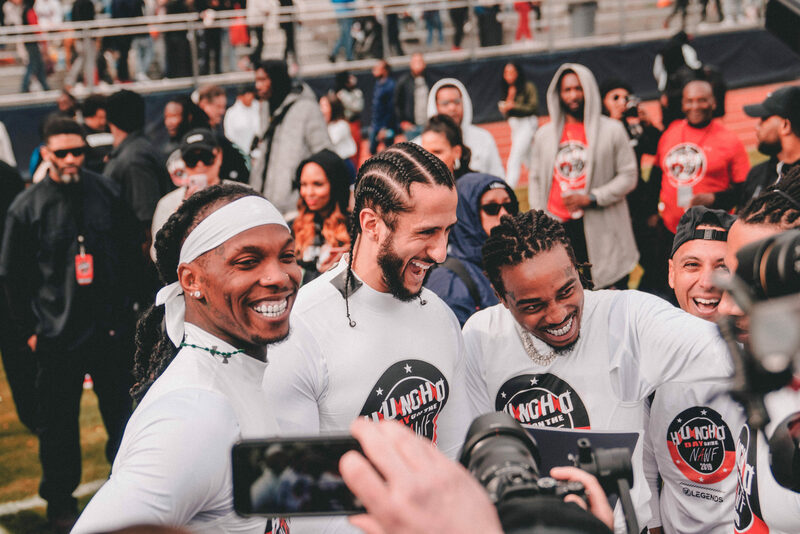 A group photo (L-R) featuring Offset of The Migos, Colin Kaepernick, and Quavo of The Migos at Huncho Day 2019 in Atlanta.